In layman’s terms an LED is a solid state alternative to generating light. There are no glass bulbs, no gasses, no mercury and no filament. Light is produced very efficiently and with much less heat than standard incandescent bulbs with filament coils. LEDs are more durable and less fragile than standard glass bulbs with thin wire filaments. Instead of running a current through a filament, LED chips create light using electroluminescence. Light created through electroluminescence is much more efficient than light created through incandescence (standard light bulbs), or chemiluminescence (chemical reaction) or other methods such as sound or mechanics. What is in a LED bulb? A 5mm round (“normal” type) LED drawn in Solid Edge and Inkscape. LED chips consist of a semiconductor die in a reflective cavity that is mounted on an ‘Anvil’. The Anvil is mounted adjacent to (but not touching) a ‘Post’ and connected by a wire. The Anvil and Post together are referred to as the ‘Leadframe’ and are mounted on silicone sub-mounts. This assembly is the ‘heart’ of the LED bulb. The assembly is connected to a positive anode and negative cathode which supplies power to the unit. Everything is mounted to (and held together by a base that is generally composed of epoxy and/or silicone. An epoxy lens/dome covers the entire assembly. Multiple LED assemblies are generally combined to create a ‘bulb’. 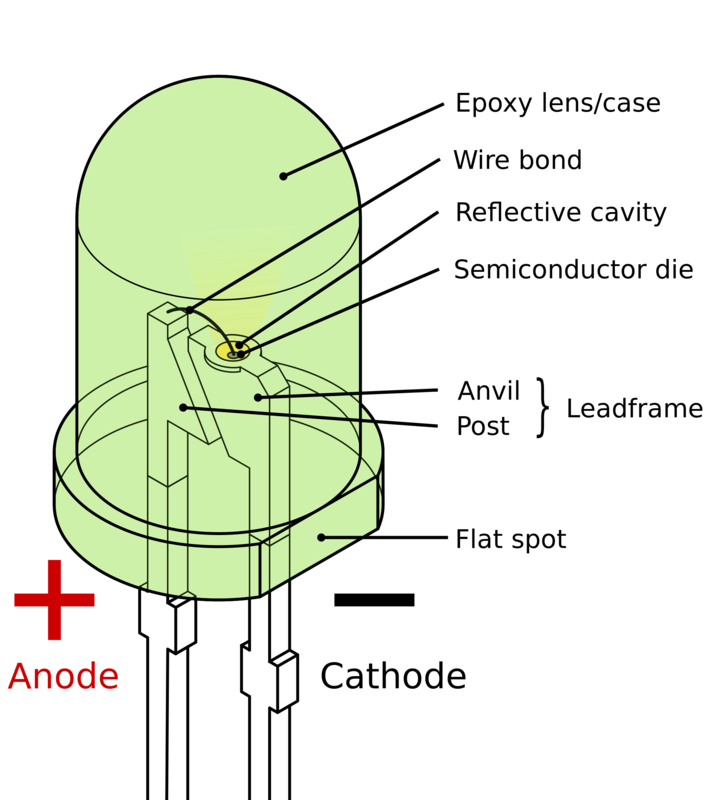 The lumins (brightness) of the bulb is mostly determined by the number and design of the LEDs. LED is poised to fundamentally change lighting in the United States. The U.S. Department of Energy has estimated that by 2017 total LED lighting will provided a savings of more than $30 billion at today’s electricity prices¹. We’ve written articles about the benefits of LED lighting and you can read one of them here. The outdoor lighting industry is at the forefront of the switch to LED. Now you’ll be able to answer the question, what is an LED bulb. If you’d like to learn more or see how LED can brighten your life give us a ring. 1. LED Lighting ~ Energy.gov – U.S. Department of Energy.